Do you remember this geranium from last year? 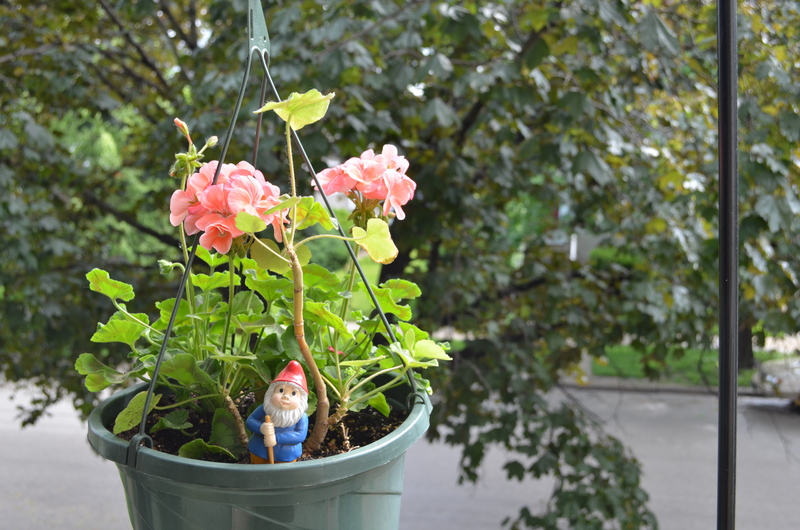 Well, it’s back outside again this spring–it’s the tall, skinny, flowerless one right by the gnome above. Last year, it lived with a couple of annuals and an ivy geranium (which, sadly, did not make it through the winter). This year, I planted a couple of fresh new geraniums with it. It looks nice and colorful in the hanging pot. 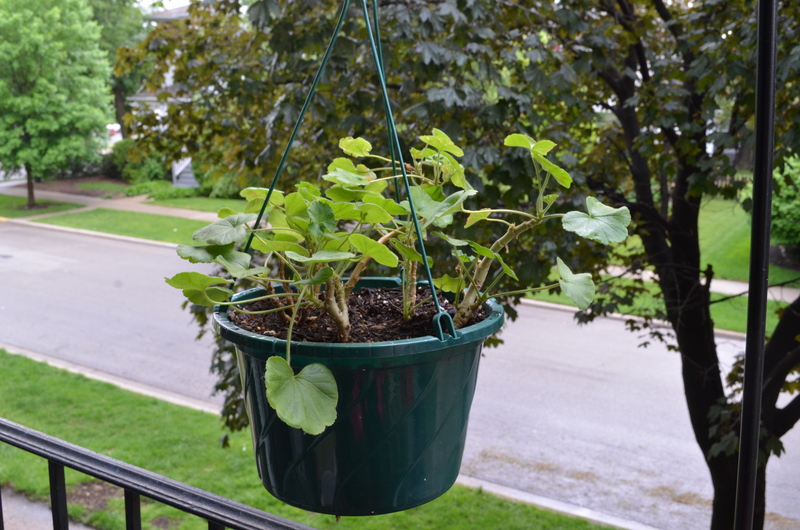 The trouble is, I have another hanging pot filled completely with last year’s geraniums. It looks sad. See? It’s just hanging out…not producing any flowers…last year, my old geranium didn’t bloom until August…I don’t want this pot to languish without blooms until then. Is there anything I can do to hurry it along? It’s too late for this year, but it looks like I should take a different approach to overwintering my growing geranium collection. (I just leave them all in their pots in a north facing window…not much overwintering there!) This article from the Iowa State University Extension Program was informational on the proper way to overwinter geraniums…I’m hoping next year, my plants will be ready for blooming in the spring! I think geraniums are having a rough year. The ones I have seen at garden centers do not look good. I picked some up and am anxious to see how they do. Interesting! The new ones I purchased this year (at Menards for $0.98) are looking good so far (crossing my fingers that they stay that way!) It’s just the ones that I kept from last year that are slow to bloom, unfortunately. Good luck with yours! Let me know how they do! !